The -Basic- version is compatible with everything, and can be installed/removed anytime you like. The -Enhanced- version overhauls all the inns and taverns, and is best used with a new game (install this mod before you start the game, loading a save from Helgen is not a new game), to ensure all the beds and persistent furnitures stay in correct position. Installing/Removing this mod mid-game will most likely leave some stubborn furnitures stuck in weird places. If a particular inn is totally messed up, that's mod conflict, it means you have another mod also modifying the interior of that inn. You can try dragging this mod to the bottom of your load order and see if that fixes the inn. 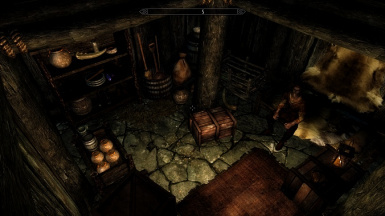 Per v1.8 this mod no longer edits the RentRoomScript.pex script, vanilla DialogueGeneric quest or any innkeepers, so is fully compatible with any other mods that modify RentRoomScript or innkeeper npcs. If you use ELFX, please use RRR_ELFX-Patch.esp, do not use ELFX-NoTaverns.esp with 1.8 version of this mod. Is the -Enhanced- version compatible with the no inns option for ETAC? Or was this in regards to the -basic- version? You can convert the mod yourself and it will work. 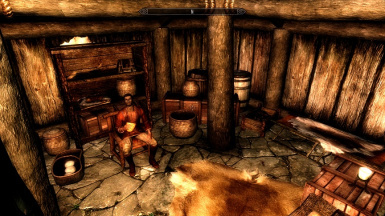 HOWEVER, if you use the Enhanced Version, you must open the converted mod in SSEEdit and delete the Cell edits to Windpeak Inn (Dawnstar), otherwise you will CTD upon entering it. Actually, you don't have to do that. 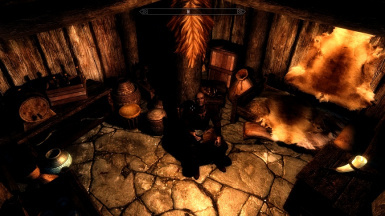 The reason why it crashes in SSE when you enter the Windpeak Inn, is the NPC Sittar added by the mod has a corrupt appearance. Open the mod in the CK after converting it, change the face parts and face morph of the Sittar NPC (xx054093), export the facegen, and save. Hey I need to do this could give me a more through guide on how to edit that specific character? Never mind, I was able to figure out how to fix the faceGenData. Mod is working fine in minor testing no CTD. I am going to see if I can get permission to post it to SSE. Unfortunately, I havent heard back on the porting permission ?. In response to post #62374027. #67435446 is also a reply to the same post. keypuncher wrote: Actually, you don't have to do that. How specifically did you fix it? Some of us - like me - are apparently not smart enough, as I tried changing the parts and morph in Creation Kit, exporting the facegen and saving, but it didn't fix it. See I am getting a no glitch when I enter the drunken huntsman where there is no floor what’s so ever. Only mods that I use that alter huntsman are jk, realistic inns and tavern, immersive citizens and unique shops and stores. I am sure the issue is between unique shops and realistic inns and tavern. I am pretty sure it’s due to load order but does anyone know which one should come first. Update the issue was actually happening does to unique shops. If you look in his SLE page he mentioned this. You might have to go through some comment pages. Delete some of the used/unfinished floor textures in SSEEfit or Tes5Edit. You don't need the Enchanced Version for the follower room rental dialogue options, but if you use the basic options your followers won't actually sleep. Otherwise this mod is entirely compatible with JK's Skyrim. The mod appears to have deleted the double bed that is the only one you can sleep in at the inn. This makes forking over the cash pointless, and it makes it impossible to trigger the quest with the ghost and stuff. Just leaving that there for anyone wondering what the heck happened to the bed. Bummer, I was going to use this on a new game - can you start that quest with the console instead? I stayed in this inn the other night (in game, not, uh, in real life, obviously). It's one of those inns where the guest rooms are downstairs (like Heljarchen). The bed's still there, and the quest works fine. 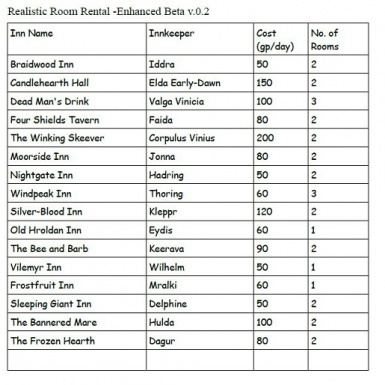 I did an extended rental of the room at the Bannered Mare. Hulda charged me 400 Septims and said this would cover the first few nights after which I'd have to keep paying regularly. However, she immediately charged me another 100 Septims the very next day and then again every 24 hours. So what exactly did I pay the extra 300 for at the beginning? Is this an oversight / bug or is there a point to this? This mod comes with a detailed MCM menu that allows you to modify the prices of everything. Make sure you didn't accidentally set it up so that you get charged exorbitant amounts. Either way this is not a problem I was able to recreate in my game, so it's likely client side. 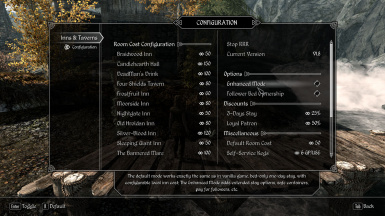 CAn anyone tell me if the Enhanced version works with "More tavern Idles" mod or " immersive beds" mods. It sounds interesting but is old and possibly buggy. I use realistic needs& diseases (really good mod) but it could use an update and can be inconsistent as well. I can;t have the option to ask for a room which normally I can buy room for me and my follower also the price for the room won't change from 10 gold. I have the MCM and everything but the prices are still 10g per room, and also I don't get the extra options even if I turn on enhanced mode. So it's like the mod is installed and shows up in MCM, but doesn't work. xEdit only showed a few minor cell conflicts with ELFX, and nothing to do with the prices. Well there is a patch for RRR and ELFX use it. Second you must have another mod that is overwriting this.